AdvancedSkeleton End User License Agreement (EULA) This is a legal agreement between you and AnimationStudios covering your use of AdvancedSkeleton (the "Software"). 1) AdvancedSkeleton is provided as freeware, but only for private, non-commercial use (that means at home). If you intend to use AdvancedSkeleton at your place of business or for commercial purposes, please purchase it. Please contact Animationstudios by E-Mail for prices, discounts and payment methods. 2) If you wish to use any of the AdvancedSkeleton example rigs for any commercial project, please obtain a AdvancedSkeleton license. For non-commercial projects, such as student work, please add "Rig by AdvancedSkeleton" to the credits, and if the the project is will be avaiable for viewing online, please email us a link. 3) AdvancedSkeleton Software is owned by AnimationStudios and is protected by copyright laws and international treaty provisions. Therefore, you must treat the Software like any other copyrighted material. 4) You may not distribute, rent, sub-license or otherwise make available to others the Software or documentation or copies thereof, except as expressly permitted in this License without prior written consent from AnimationStudios. In the case of an authorized transfer, the transferee must agree to be bound by the terms and conditions of this License Agreement. 5) You may not remove any proprietary notices, labels, trademarks on the Software or documentation. You may not modify, de-compile, disassemble or reverse engineer the Software. 6) Limited warranty: AdvancedSkeleton tools, rigs and documentation are "as is" without any warranty as to their performance, merchantability or fitness for any particular purpose. The licensee assumes the entire risk as to the quality and performance of the software. In no event shall AnimationStudios or anyone else who has been involved in the creation, development, production, or delivery of this software be liable for any direct, incidental or consequential damages, such as, but not limited to, loss of anticipated profits, benefits, use, or data resulting rom the use of this software, or arising out of any breach of warranty. Copyright (C) 2018 by AnimationStudios, Oslo, Norway. Internet: http://www.animationstudios.com.au Email: support@animationstudios.com.au All rights reserved. "I like your plug-in, thank you for your giv..."
"this script is very nice . I loved"
"how to add adv to MAYA?How to use?I don&#39;t k..."
"Autodesk should hire you buddy." "This is the best tool for me, wish there is..."
Really great and versatile rigging tools, I use this every day. All users gets support. Just email support@animationstudios.com.au, as it says in the "About" section of the tool. Dont just comment on facebook or at highend3d, etc. Email him. I get his support from day one. Sometimes, it takes him some days to reply indeed (not everyone are online and reply every single comments, they have work to do, right?). When he didn't reply, he make videos for your issues (www.youtube.com/user/AdvancedSkeleton) and most of the issues are from your mis-understanding on how the script works. I always watch every single of his videos before asking a question. This script is a prime example of a developer tacking on too much bloat instead of focusing on the core of the script. Ive been tracking AS progress over the years since back in the pre-facial days. Its a horrid script unless you plan to use it on very basic topology and completely ignore anything besides the rigging functions. Each release ive tried this, something down the line will go wrong. Something completely out of nowhere like maybe a bone doesnt tag, a control doesnt parent correctly, or even ncloth simply messing up. You wont know why or what caused. Whats even worse? The developer charges full license price for support. No Money = No Support. Which means whatever completely random problem you've come accross will never be solved. I think its also intended so you're more likely to pay for a license which is understandable. It would take time to answer all those support emails for free. However instead of tacking on shape editors or "utilities" it wouldve been great to really stabilize the rigging section instead. The script had amazing potential down the line. Now its a bloated mess that tacks on more than it fixes. Save yourself the headache and the uncertain reliance on this thing and learn to rig yourself. 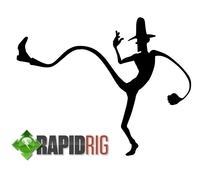 It aint hard to make your own flexible rig, just take a weekend and learn. It will take you further than this. In theory this program wouldve been amazing. In reality it has all the stability of a drunken prom date. Autodesk should hire you buddy.